This article is about the astronomer. For other uses, see Tycho Brahe (disambiguation). Tycho Brahe (/ˈtiːkoʊ, ˈtaɪ- ˈbrɑː, ˈbrɑːhi, -(h)ə/; born Tyge Ottesen Brahe;[a] 14 December 1546 – 24 October 1601) was a Danish nobleman, astronomer, and writer known for his accurate and comprehensive astronomical and planetary observations. He was born in the then Danish peninsula of Scania. Well known in his lifetime as an astronomer, astrologer and alchemist, he has been described as "the first competent mind in modern astronomy to feel ardently the passion for exact empirical facts." His observations were some five times more accurate than the best available observations at the time. An heir to several of Denmark's principal noble families, he received a comprehensive education. He took an interest in astronomy and in the creation of more accurate instruments of measurement. As an astronomer, Tycho worked to combine what he saw as the geometrical benefits of the Copernican system with the philosophical benefits of the Ptolemaic system into his own model of the universe, the Tychonic system. His system correctly saw the Moon as orbiting Earth, and the planets as orbiting the Sun, but erroneously considered the Sun to be orbiting the Earth. Furthermore, he was the last of the major naked-eye astronomers, working without telescopes for his observations. In his De nova stella (On the New Star) of 1573, he refuted the Aristotelian belief in an unchanging celestial realm. 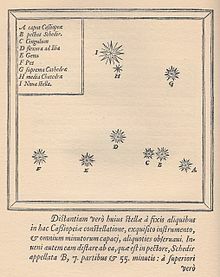 His precise measurements indicated that "new stars" (stellae novae, now known as supernovae), in particular that of 1572, lacked the parallax expected in sublunar phenomena and were therefore not tailless comets in the atmosphere as previously believed but were above the atmosphere and beyond the moon. Using similar measurements he showed that comets were also not atmospheric phenomena, as previously thought, and must pass through the supposedly immutable celestial spheres. Tycho's body has been exhumed twice, in 1901 and 2010, to examine the circumstances of his death and to identify the material from which his artificial nose was made. The conclusion was that his death was likely caused by a burst bladder, and not by poisoning as had been suggested, and that the artificial nose was more likely made of brass than silver or gold, as some had believed in his time. Tycho was born as heir to several of Denmark's most influential noble families and in addition to his immediate ancestry with the Brahe and the Bille families, he also counted the Rud, Trolle, Ulfstand, and Rosenkrantz families among his ancestors. Both of his grandfathers and all of his great grandfathers had served as members of the Danish king's Privy Council. His paternal grandfather and namesake Thyge Brahe was the lord of Tosterup Castle in Scania and died in battle during the 1523 Siege of Malmö during the Lutheran Reformation Wars. His maternal grandfather Claus Bille, lord to Bohus Castle and a second cousin of Swedish king Gustav Vasa, participated in the Stockholm Bloodbath on the side of the Danish king against the Swedish nobles. 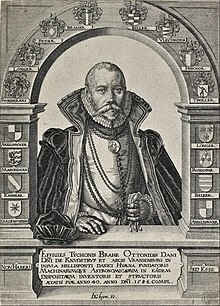 Tycho's father Otte Brahe, like his father a royal Privy Councilor, married Beate Bille, who was herself a powerful figure at the Danish court holding several royal land titles. Both parents are buried under the floor of Kågeröd Church, four kilometres east of Knutstorp. Tycho was born at his family's ancestral seat of Knutstorp Castle (Danish: Knudstrup borg; Swedish: Knutstorps borg), about eight kilometres north of Svalöv in then Danish Scania. He was the oldest of 12 siblings, 8 of whom lived to adulthood. His twin brother died before being baptized. Tycho later wrote an ode in Latin to his dead twin, which was printed in 1572 as his first published work. An epitaph, originally from Knutstorp, but now on a plaque near the church door, shows the whole family, including Tycho as a boy. When he was only two years old Tycho was taken away to be raised by his uncle Jørgen Thygesen Brahe and his wife Inger Oxe (sister to Peder Oxe, Steward of the Realm) who were childless. It is unclear why Otte Brahe reached this arrangement with his brother, but Tycho was the only one of his siblings not to be raised by his mother at Knutstorp. Instead, Tycho was raised at Jørgen Brahe's estate at Tosterup and at Tranekær on the island of Langeland, and later at Næsbyhoved Castle near Odense, and later again at the Castle of Nykøbing on the island of Falster. Tycho later wrote that Jørgen Brahe "raised me and generously provided for me during his life until my eighteenth year; he always treated me as his own son and made me his heir". From ages 6 to 12, Tycho attended Latin school, probably in Nykøbing. At age 12, on 19 April 1559, Tycho began studies at the University of Copenhagen. There, following his uncle's wishes, he studied law, but also studied a variety of other subjects and became interested in astronomy. At the University, Aristotle was a staple of scientific theory, and Tycho likely received a thorough training in Aristotelian physics and cosmology. He experienced the solar eclipse of 21 August 1560, and was greatly impressed by the fact that it had been predicted, although the prediction based on current observational data was a day off. He realized that more accurate observations would be the key to making more exact predictions. He purchased an ephemeris and books on astronomy, including Johannes de Sacrobosco's De sphaera mundi, Petrus Apianus's Cosmographia seu descriptio totius orbis and Regiomontanus's De triangulis omnimodis. Jørgen Thygesen Brahe, however, wanted Tycho to educate himself in order to become a civil servant, and sent him on a study tour of Europe in early 1562. 15-year old Tycho was given as mentor the 19-year-old Anders Sørensen Vedel, whom he eventually talked into allowing the pursuit of astronomy during the tour. Vedel and his pupil left Copenhagen in February 1562. On 24 March, they arrived in Leipzig, where they matriculated at the Lutheran Leipzig University. In 1563, he observed a conjunction of Jupiter and Saturn, and noticed that the Copernican and Ptolemaic tables used to predict the conjunction were inaccurate. This led him to realize that progress in astronomy required systematic, rigorous observation, night after night, using the most accurate instruments obtainable. He began maintaining detailed journals of all his astronomical observations. In this period, he combined the study of astronomy with astrology, laying down horoscopes for different famous personalities. When Tycho and Vedel returned from Leipzig in 1565, Denmark was at war with Sweden, and as vice-admiral of the Danish fleet, Jørgen Brahe had become a national hero for having participated in the sinking of the Swedish warship Mars during the First battle of Öland (1564). Shortly after Tycho's arrival in Denmark, Jørgen Brahe was defeated in the Action of 4 June 1565, and shortly afterwards died of a fever. Stories have it that he contracted pneumonia after a night of drinking with the Danish King Frederick II when the king fell into the water in a Copenhagen canal and Brahe jumped in after him. Brahe's possessions passed on to his wife Inger Oxe, who considered Tycho with special fondness. In 1566, Tycho Brahe left to study at the University of Rostock. Here, he studied with professors of medicine at the university's famous medical school, and became interested in medical alchemy and botanical medicine. On 29 December 1566, Tycho lost part of his nose in a sword duel with a fellow Danish nobleman, his third cousin Manderup Parsberg. The two had drunkenly quarreled over who was the superior mathematician at an engagement party at the home of Professor Lucas Bachmeister on 10 December. Coming nearly to blows again on the 29th, they ended up resolving their feud with a duel in the dark. Though the two were later reconciled, the duel resulted in Tycho losing the bridge of his nose, and gaining a broad scar across his forehead. He received the best possible care at the university, and wore a prosthetic nose for the rest of his life. It was kept in place with paste or glue, and said to be made of silver and gold. In November 2012, Danish and Czech researchers reported that the prosthetic was actually made out of brass after chemically analyzing a small bone sample from the nose from the body exhumed in 2010. In April 1567, Tycho returned home from his travels, with a firm intention of becoming a scientist. Although he had been expected to go into politics and the law, like most of his kinsmen, and although Denmark was still at war with Sweden, his family supported his decision to dedicate himself to the sciences. His father wanted him to take up law, but Tycho was allowed to travel to Rostock and then to Augsburg (where he built a great quadrant), Basel, and Freiburg. In 1568, he was appointed a canon at the Cathedral of Roskilde, a largely honorary position that would allow him to focus on his studies. At the end of 1570, he was informed of his father's ill health, so he returned to Knutstorp Castle, where his father died on 9 May 1571. The war was over, and the Danish lords soon returned to prosperity. Soon, another uncle, Steen Bille, helped him build an observatory and alchemical laboratory at Herrevad Abbey. Towards the end of 1571, Tycho fell in love with Kirsten, daughter of Jørgen Hansen, the Lutheran minister in Knudstrup. As she was a commoner, Tycho never formally married her, since if he did he would lose his noble privileges. However, Danish law permitted morganatic marriage, which meant that a nobleman and a common woman could live together openly as husband and wife for three years, and their alliance then became a legally binding marriage. However, each would maintain their social status, and any children they had together would be considered commoners, with no rights to titles, landholdings, coat of arms, or even their father's noble name. While King Frederick respected Tycho's choice of wife, himself having been unable to marry the woman he loved, many of Tycho's family members disagreed, and many churchmen would continue to hold the lack of a divinely sanctioned marriage against him. Kirsten Jørgensdatter gave birth to their first daughter, Kirstine (named after Tycho's late sister) on 12 October 1573. Kirstine died from the plague in 1576, and Tycho wrote a heartfelt elegy for her tombstone. In 1574, they moved to Copenhagen where their daughter Magdalene was born, later the family followed him into exile. Kirsten and Tycho lived together for almost thirty years until Tycho's death. Together, they had eight children, six of whom lived to adulthood. Star map of the constellation Cassiopeia showing the position of the supernova of 1572 (the topmost star, labelled I); from Tycho Brahe's De nova stella. On 11 November 1572, Tycho observed (from Herrevad Abbey) a very bright star, now numbered SN 1572, which had unexpectedly appeared in the constellation Cassiopeia. Because it had been maintained since antiquity that the world beyond the Moon's orbit was eternally unchangeable (celestial immutability was a fundamental axiom of the Aristotelian world-view), other observers held that the phenomenon was something in the terrestrial sphere below the Moon. However, in the first instance, Tycho observed that the object showed no daily parallax against the background of the fixed stars. This implied it was at least farther away than the Moon and those planets that do show such parallax. He also found the object did not change its position relative to the fixed stars over several months, as all planets did in their periodic orbital motions, even the outer planets for which no daily parallax was detectable. This suggested it was not even a planet, but a fixed star in the stellar sphere beyond all the planets. In 1573, he published a small book, De nova stella thereby coining the term nova for a "new" star (we now classify this star as a supernova and we know that it is 7,500 light-years from Earth). This discovery was decisive for his choice of astronomy as a profession. Tycho was strongly critical of those who dismissed the implications of the astronomical appearance, writing in the preface to De nova stella: "O crassa ingenia. O caecos coeli spectatores" ("Oh thick wits. Oh blind watchers of the sky"). The publication of his discovery made him a well-known name among scientists across Europe. Tycho continued with his detailed observations, often assisted by his first assistant and student, his younger sister Sophie Brahe. In 1574, Tycho published the observations made in 1572 from his first observatory at Herrevad Abbey. He then started lecturing on astronomy, but gave it up and left Denmark in spring 1575 to tour abroad. He first visited William IV, Landgrave of Hesse-Kassel's observatory at Kassel, then went on to Frankfurt, Basel and Venice, where he acted as an agent for the Danish king, contacting artisans and craftsmen whom the king wanted to work on his new palace at Elsinore. Upon his return, the King wished to repay Tycho's service by offering him a position worthy of his family; he offered him a choice of lordships of militarily and economically important estates, such as the castles of Hammershus or Helsingborg. But Tycho was reluctant to take up a position as a lord of the realm, preferring to focus on his science. He wrote to his friend Johannes Pratensis, "I did not want to take possession of any of the castles our benevolent king so graciously offered me. I am displeased with society here, customary forms and the whole rubbish". Tycho secretly began to plan to move to Basel, wishing to participate in the burgeoning academic and scientific life there. But the King heard of Tycho's plans, and desiring to keep the distinguished scientist, he offered Tycho the island of Hven in Øresund and funding to set up an observatory. Until then, Hven had been property directly under the Crown, and the 50 families on the island considered themselves to be freeholding farmers, but with Tycho Brahe's appointment as Feudal Lord of Hven, this changed. Tycho took control of agricultural planning, requiring the peasants to cultivate twice as much as they had done before, and he also exacted corvée labor from the peasants for the construction of his new castle. The peasants complained about Brahe's excessive taxation and took him to court. The court established Tycho's right to levy taxes and labor, and the result was a contract detailing the mutual obligations of lord and peasants on the island. Brahe envisioned his castle Uraniborg as a temple dedicated to the muses of arts and sciences, rather than as a military fortress; indeed, it was named after Urania, the muse of astronomy. Construction began in 1576 (with a laboratory for his alchemical experiments in the cellar). Uraniborg was inspired by the Venetian architect Andrea Palladio, and was one of the first buildings in northern Europe to show influence from Italian renaissance architecture. When he realized that the towers of Uraniborg were not adequate as observatories because of the instruments' exposure to the elements and the movement of the building, he then constructed a second underground observatory at nearby Stjerneborg in 1581. The basement included an alchemical laboratory with 16 furnaces for conducting distillations and other chemical experiments. Unusually for the time, Tycho established Uraniborg as a research centre, where almost 100 students and artisans worked from 1576 to 1597. Uraniborg also contained a printing press and a paper mill, both among the first in Scandinavia, enabling Tycho to publish his own manuscripts, on locally made paper with his own watermark. He created a system of ponds and canals to run the wheels of the paper mill. Over the years he worked on Uraniborg, Tycho was assisted by a number of students and protegés, many of whom went on to their own careers in astronomy: among them were Christian Sørensen Longomontanus, later one of the main proponents of the Tychonic model and Tycho's replacement as royal Danish astronomer; Peder Flemløse; Elias Olsen Morsing; and Cort Aslakssøn. Tycho's instrument-maker Hans Crol also formed part of the scientific community on the island. Brahe's notebook with his observations of the 1577 comet. Drawing of the above ground parts of Tycho Brahe's underground observatory "Stjerneborg". The support that Tycho received from the Crown was substantial, amounting to 1% of the annual total revenue at one point in the 1580s. Tycho often held large social gatherings in his castle. Pierre Gassendi wrote that Tycho also had a tame elk (moose) and that his mentor the Landgrave Wilhelm of Hesse-Kassel (Hesse-Cassel) asked whether there was an animal faster than a deer. Tycho replied that there was none, but he could send his tame elk. When Wilhelm replied he would accept one in exchange for a horse, Tycho replied with the sad news that the elk had just died on a visit to entertain a nobleman at Landskrona. Apparently, during dinner, the elk had drunk a lot of beer, fallen down the stairs, and died. Among the many noble visitors to Hven was James VI of Scotland, who married the Danish princess Anne. After his visit to Hven in 1590, he wrote a poem comparing Tycho Brahe with Apollon and Phaethon. As part of Tycho's duties to the Crown in exchange for his estate, he fulfilled the functions of a royal astrologer. At the beginning of each year, he had to present an Almanac to the court, predicting the influence of the stars on the political and economic prospects of the year. And at the birth of each prince, he prepared their horoscopes, predicting their fates. He also worked as a cartographer with his former tutor Anders Sørensen Vedel on mapping out all of the Danish realm. An ally of the king and friendly with Queen Sophie (both his mother Beate Bille and adoptive mother Inger Oxe had been her court maids), he secured a promise from the King that ownership of Hven and Uraniborg would pass to his heirs. In 1588, Tycho's royal benefactor died, and a volume of Tycho's great two-volume work Astronomiae Instauratae Progymnasmata (Introduction to the New Astronomy) was published. The first volume, devoted to the new star of 1572, was not ready, because the reduction of the observations of 1572–3 involved much research to correct the stars' positions for refraction, precession, the motion of the Sun etc., and was not completed in Tycho's lifetime (it was published in Prague in 1602/03), but the second volume, titled De Mundi Aetherei Recentioribus Phaenomenis Liber Secundus (Second Book About Recent Phenomena in the Celestial World) and devoted to the comet of 1577, was printed at Uraniborg and some copies were issued in 1588. Besides the comet observations, it included an account of Tycho's system of the world. The third volume was intended to treat the comets of 1580 and following years in a similar manner, but it was never published, nor even written, though a great deal of material about the comet of 1585 was put together and first published in 1845 with the observations of this comet. While at Uraniborg, Tycho Brahe maintained correspondence with scientists and astronomers across Europe. He inquired about other astronomers' observations and shared his own technological advances to help them achieve more accurate observations. Thus, his correspondence was crucial to his research. Often, correspondence was not just private communication between scholars, but also a way to disseminate results and arguments and to build progress and scientific consensus. Through correspondence, Tycho Brahe was involved in several personal disputes with critics of his theories. Prominent among them were John Craig, a Scottish physician who was a strong believer in the authority of the Aristotelian worldview, and Nicolaus Reimers Baer, known as Ursus, an astronomer at the Imperial court in Prague, whom Tycho accused of having plagiarized his cosmological model. Craig refused to accept Brahe's conclusion that the comet of 1577 had to be located within the aetherial sphere rather than within the atmosphere of Earth. Craig tried to contradict Brahe by using his own observations of the comet, and by questioning his methodology. Brahe published an apologia (a defense) of his conclusions, in which he provided additional arguments, as well as condemning Craig's ideas in strong language for being incompetent. Another dispute concerned the mathematician Paul Wittich, who, after staying on Hven in 1580, taught Count Wilhelm of Kassel and his astronomer Christoph Rothmann to build copies of Brahe's instruments without permission from Brahe. In turn, Craig, who had studied with Wittich, accused Brahe of minimizing Wittich's role in developing some of the trigonometric methods used by Brahe. In his dealings with these disputes, Tycho Brahe made sure to leverage his support in the scientific community, by publishing and disseminating his own answers and arguments. have I offended you my fatherland? But was I wrong to spread your fame abroad? Tell me, who has done such things before? And sung your honor to the very stars? When Frederick died in 1588, his son and heir Christian IV was only 11 years old. A regency council was appointed to rule for the young prince-elect until his coronation in 1596. The head of the council (Steward of the Realm) was Christoffer Valkendorff, who disliked Tycho Brahe after a conflict between them, and hence Tycho's influence at the Danish court steadily declined. Feeling that his legacy on Hven was in peril, he approached the Dowager Queen Sophie and asked her to affirm in writing her late husband's promise to endow Hven to Tycho's heirs. Nonetheless, he realized that the young king was more interested in war than in science, and was of no mind to keep his father's promise. King Christian IV followed a policy of curbing the power of the nobility by confiscating their estates to minimize their income bases, by accusing nobles of misusing their offices and of heresies against the Lutheran church. Tycho, who was known to sympathize with the Philippists (followers of Philip Melanchthon), was among the nobles who fell out of grace with the new king. The king's unfavorable disposition towards Tycho was likely also a result of efforts by several of his enemies at court to turn the king against him. Tycho's enemies included, in addition to Valkendorff, the king's doctor Peter Severinus, who also had a personal gripes with Brahe, and several gnesio-Lutheran Bishops who suspected Brahe of heresy — a suspicion motivated by his known Philippist sympathies, his pursuits in medicine and alchemy (both of which he practiced without the church's approval) and his prohibiting the local priest on Hven to include the exorcism in the baptismal ritual. Among the accusations raised against Tycho Brahe were his failure to adequately maintain the royal chapel at Roskilde, and his harshness and exploitation of the Hven peasantry. The straw that broke the camel's back for Tycho was when a mob of commoners, possibly incited by his enemies at court, rioted in front of his house in Copenhagen. Tycho Brahe left Hven in 1597, bringing some of his instruments with him to Copenhagen, and entrusting others to a caretaker on the island. Shortly before leaving, he completed his star catalogue giving the positions of 1,000 stars. After some unsuccessful attempts at influencing the king to let him return, he finally acquiesced to exile, but he wrote his most famous poem Elegy to Dania in which he chided Denmark for not appreciating his genius. The instruments he had used in Uraniborg and Stjerneborg were depicted and described in detail in his book Astronomiae instauratae mechanica or Instruments for the restoration of astronomy, first published in 1598. The King sent two envoys to Hven to describe the instruments left behind by Brahe. Unversed in astronomy, the envoys reported to the king that the large mechanical contraptions such as his large quadrant and sextant were "useless and even harmful". From 1597 to 1598, he spent a year at the castle of his friend Heinrich Rantzau in Wandesburg outside Hamburg, and then they moved for a while to Wittenberg, where they stayed in the former home of Philip Melanchthon. In 1599, he obtained the sponsorship of Rudolf II, Holy Roman Emperor and moved to Prague, as Imperial Court Astronomer. Tycho built a new observatory in a castle in Benátky nad Jizerou, 50 km from Prague, and worked there for one year. The emperor then brought him back to Prague, where he stayed until his death. At the imperial court even Tycho's wife and children were treated like nobility, which they had never been at the Danish court. Tycho received financial support from several nobles in addition to the emperor, including Oldrich Desiderius Pruskowsky von Pruskow, to whom he dedicated his famous Mechanica. In return for their support, Tycho's duties included preparing astrological charts and predictions for his patrons at events such as births, weather forecasting, and astrological interpretations of significant astronomical events, such as the supernova of 1572 (sometimes called Tycho's supernova) and the Great Comet of 1577. In Prague, Tycho worked closely with Johannes Kepler, his assistant. Kepler was a convinced Copernican, and considered Tycho's model to be mistaken, and derived from simple "inversion" of the Sun's and Earth's positions in the Copernican model. Together, the two worked on a new star catalogue based on his own accurate positions — this catalogue became the Rudolphine Tables. Also at the court in Prague was the mathematician Nicolaus Reimers (Ursus), with whom Tycho had previously corresponded, and who, like Tycho, had developed a geo-heliocentric planetary model, which Tycho considered to have been plagiarized from his own. Kepler had previously spoken highly of Ursus, but now found himself in the problematic position of being employed by Tycho and having to defend his employer against Ursus' accusations, even though he disagreed with both of their planetary models. In 1600, he finished the tract Apologia pro Tychone contra Ursum (defense of Tycho against Ursus). Kepler had great respect for Tycho's methods and the accuracy of his observations and considered him to be the new Hipparchus, who would provide the foundation for a restoration of the science of astronomy. Tycho suddenly contracted a bladder or kidney ailment after attending a banquet in Prague, and died eleven days later, on 24 October 1601, at the age of 54. According to Kepler's first-hand account, Tycho had refused to leave the banquet to relieve himself because it would have been a breach of etiquette. After he returned home, he was no longer able to urinate, except eventually in very small quantities and with excruciating pain. The night before he died, he suffered from a delirium during which he was frequently heard to exclaim that he hoped he would not seem to have lived in vain. Before dying, he urged Kepler to finish the Rudolphine Tables and expressed the hope that he would do so by adopting Tycho's own planetary system, rather than that of Copernicus. It was reported that Brahe had written his own epitaph, "He lived like a sage and died like a fool." A contemporary physician attributed his death to a kidney stone, but no kidney stones were found during an autopsy performed after his body was exhumed in 1901, and the 20th-century medical assessment is that his death is more likely to have resulted from uremia. The investigations in the 1990s have suggested that Tycho may not have died from urinary problems, but instead from mercury poisoning. It was speculated that he had been intentionally poisoned. The two main suspects were his assistant, Johannes Kepler, whose motives would be to gain access to Brahe's laboratory and chemicals, and his cousin, Erik Brahe, at the order of friend-turned-enemy Christian IV, because of rumors that Tycho had had an affair with Christian's mother. In February 2010, the Prague city authorities approved a request by Danish scientists to exhume the remains, and in November 2010 a group of Czech and Danish scientists from Aarhus University collected bone, hair and clothing samples for analysis. The scientists, led by Dr Jens Vellev, analyzed Tycho's beard hair once again. The team reported in November 2012 that not only was there not enough mercury present to substantiate murder, but that there were no lethal levels of any poisons present. The team's conclusion was that "it is impossible that Tycho Brahe could have been murdered". The findings were confirmed by scientists from the University of Rostock, who examined a sample of Brahe's beard hairs that had been taken in 1901. Although traces of mercury were found, these were present only in the outer scales. Therefore, mercury poisoning as the cause of death was ruled out, while the study suggests that the accumulation of mercury may have come from the "precipitation of mercury dust from the air during [Brahe's] long-term alchemistic activities". The hair samples contain 20–100 times the natural concentration of gold until 2 months before his death. Tycho is buried in the Church of Our Lady before Týn, in Old Town Square near the Prague Astronomical Clock. Tycho's view of science was driven by his passion for accurate observations, and the quest for improved instruments of measurement drove his life's work. Tycho was the last major astronomer to work without the aid of a telescope, soon to be turned skyward by Galileo and others. Given the limitations of the naked eye for making accurate observations, he devoted many of his efforts to improving the accuracy of the existing types of instrument — the sextant and the quadrant. He designed larger versions of these instruments, which allowed him to achieve much higher accuracy. Because of the accuracy of his instruments, he quickly realized the influence of wind and the movement of buildings, and instead opted to mount his instruments underground directly on the bedrock. Tycho's observations of stellar and planetary positions were noteworthy both for their accuracy and quantity. With an accuracy approaching one arcminute, his celestial positions were much more accurate than those of any predecessor or contemporary — about five times as accurate as the observations of the contemporary astronomer Wilhelm of Hesse. Rawlins (1993:§B2) asserts of Tycho's Star Catalog D, "In it, Tycho achieved, on a mass scale, a precision far beyond that of earlier catalogers. Cat D represents an unprecedented confluence of skills: instrumental, observational, & computational—all of which combined to enable Tycho to place most of his hundreds of recorded stars to an accuracy of ordermag 1'!" Drawing of a large quadrant used by Tycho Brahe. Celestial objects observed near the horizon and above appear with a greater altitude than the real one, due to atmospheric refraction, and one of Tycho's most important innovations was that he worked out and published the very first tables for the systematic correction of this possible source of error. But, as advanced as they were, they attributed no refraction whatever above 45 degrees altitude for solar refraction, and none for starlight above 20 degrees altitude. To perform the huge number of multiplications needed to produce much of his astronomical data, Tycho relied heavily on the then new technique of prosthaphaeresis, an algorithm for approximating products based on trigonometric identities that predated logarithms. Although Tycho admired Copernicus and was the first to teach his theory in Denmark, he was unable to reconcile Copernican theory with the basic laws of Aristotelian physics, that he considered to be foundational. He was also critical of the observational data that Copernicus built his theory on, which he correctly considered to have a high margin of error. Instead, Tycho proposed a "geo-heliocentric" system in which the Sun and Moon orbited the Earth, while the other planets orbited the Sun. Tycho's system had many of the same observational and computational advantages that Copernicus' system had, and both systems also could accommodate the phases of Venus, although Galilei had yet to discover them. Tycho's system provided a safe position for astronomers who were dissatisfied with older models but were reluctant to accept the heliocentrism and the Earth's motion. It gained a considerable following after 1616 when Rome declared that the heliocentric model was contrary to both philosophy and Scripture, and could be discussed only as a computational convenience that had no connection to fact. Tycho's system also offered a major innovation: while both the purely geocentric model and the heliocentric model as set forth by Copernicus relied on the idea of transparent rotating crystalline spheres to carry the planets in their orbits, Tycho eliminated the spheres entirely. 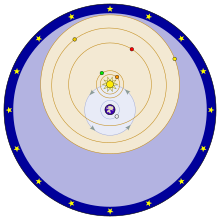 Kepler, as well as other Copernican astronomers, tried to persuade Tycho to adopt the heliocentric model of the Solar System, but he was not persuaded. According to Tycho, the idea of a rotating and revolving Earth would be "in violation not only of all physical truth but also of the authority of Holy Scripture, which ought to be paramount." such a fast motion could not belong to the earth, a body very heavy and dense and opaque, but rather belongs to the sky itself whose form and subtle and constant matter are better suited to a perpetual motion, however fast. Deduce these things geometrically if you like, and you will see how many absurdities (not to mention others) accompany this assumption [of the motion of the earth] by inference. "[W]hat is so absurd about [an average star] having size equal to the whole [orbit of the Earth]? What of this is contrary to divine will, or is impossible by divine Nature, or is inadmissible by infinite Nature? These things must be entirely demonstrated by you, if you will wish to infer from here anything of the absurd. These things that vulgar sorts see as absurd at first glance are not easily charged with absurdity, for in fact divine Sapience and Majesty is far greater than they understand. Grant the vastness of the Universe and the sizes of the stars to be as great as you like — these will still bear no proportion to the infinite Creator. It reckons that the greater the king, so much greater and larger the palace befitting his majesty. So how great a palace do you reckon is fitting to GOD?". Religion played a role in Tycho's geocentrism also – he cited the authority of scripture in portraying the Earth as being at rest. He rarely used Biblical arguments alone (to him they were a secondary objection to the idea of Earth's motion) and over time he came to focus on scientific arguments, but he did take Biblical arguments seriously. Tycho's 1587 geo-heliocentric model differed from those of other geo-heliocentric astronomers, such as Paul Wittich, Reimarus Ursus, Helisaeus Roeslin and David Origanus, in that the orbits of Mars and the Sun intersected. This was because Tycho had come to believe the distance of Mars from the Earth at opposition (that is, when Mars is on the opposite side of the sky from the Sun) was less than that of the Sun from the Earth. Tycho believed this because he came to believe Mars had a greater daily parallax than the Sun. But, in 1584, in a letter to a fellow astronomer, Brucaeus, he had claimed that Mars had been further than the Sun at the opposition of 1582, because he had observed that Mars had little or no daily parallax. He said he had therefore rejected Copernicus's model because it predicted Mars would be at only two-thirds the distance of the Sun. But, he apparently later changed his mind to the opinion that Mars at opposition was indeed nearer the Earth than the Sun was, but apparently without any valid observational evidence in any discernible Martian parallax. Such intersecting Martian and solar orbits meant that there could be no solid rotating celestial spheres, because they could not possibly interpenetrate. Arguably, this conclusion was independently supported by the conclusion that the comet of 1577 was superlunary, because it showed less daily parallax than the Moon and thus must pass through any celestial spheres in its transit. Tycho's distinctive contributions to lunar theory include his discovery of the variation of the Moon's longitude. This represents the largest inequality of longitude after the equation of the center and the evection. He also discovered librations in the inclination of the plane of the lunar orbit, relative to the ecliptic (which is not a constant of about 5° as had been believed before him, but fluctuates through a range of over a quarter of a degree), and accompanying oscillations in the longitude of the lunar node. These represent perturbations in the Moon's ecliptic latitude. Tycho's lunar theory doubled the number of distinct lunar inequalities, relative to those anciently known, and reduced the discrepancies of lunar theory to about a fifth of their previous amounts. It was published posthumously by Kepler in 1602, and Kepler's own derivative form appears in Kepler's Rudolphine Tables of 1627. Kepler used Tycho's records of the motion of Mars to deduce laws of planetary motion, enabling calculation of astronomical tables with unprecedented accuracy (the Rudolphine Tables)[d] and providing powerful support for a heliocentric model of the solar system. Galileo's 1610 telescopic discovery that Venus shows a full set of phases refuted the pure geocentric Ptolemaic model. After that it seems 17th-century astronomy mostly converted to geo-heliocentric planetary models that could explain these phases just as well as the heliocentric model could, but without the latter's disadvantage of the failure to detect any annual stellar parallax that Tycho and others regarded as refuting it. The three main geo-heliocentric models were the Tychonic, the Capellan with just Mercury and Venus orbiting the Sun such as favoured by Francis Bacon, for example, and the extended Capellan model of Riccioli with Mars also orbiting the Sun whilst Saturn and Jupiter orbit the fixed Earth. But the Tychonic model was probably the most popular, albeit probably in what was known as 'the semi-Tychonic' version with a daily rotating Earth. 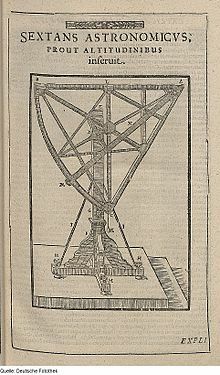 This model was advocated by Tycho's ex-assistant and disciple Longomontanus in his 1622 Astronomia Danica that was the intended completion of Tycho's planetary model with his observational data, and which was regarded as the canonical statement of the complete Tychonic planetary system. Longomontanus' work was published in several editions and used by many subsequent astronomers, and through him the Tychonic system was adopted by astronomers as far away as China. Johannes Kepler published the Rudolphine Tables containing a star catalog and planetary tables using Tycho's measurements. Hven island appears west uppermost on the base. The ardent anti-heliocentric French astronomer Jean-Baptiste Morin devised a Tychonic planetary model with elliptical orbits published in 1650 in a simplified, Tychonic version of the Rudolphine Tables. Some acceptance of the Tychonic system persisted through the 17th century and in places until the early 18th century; it was supported (after a 1633 decree about the Copernican controversy) by "a flood of pro-Tycho literature" of Jesuit origin. Among pro-Tycho Jesuits, Ignace Pardies declared in 1691 that it was still the commonly accepted system, and Francesco Blanchinus reiterated that as late as 1728. Persistence of the Tychonic system, especially in Catholic countries, has been attributed to its satisfaction of a need (relative to Catholic doctrine) for "a safe synthesis of ancient and modern". After 1670, even many Jesuit writers only thinly disguised their Copernicanism. But in Germany, the Netherlands, and England, the Tychonic system "vanished from the literature much earlier". James Bradley's discovery of stellar aberration, published in 1729, eventually gave direct evidence excluding the possibility of all forms of geocentrism including Tycho's. Stellar aberration could only be satisfactorily explained on the basis that the Earth is in annual orbit around the Sun, with an orbital velocity that combines with the finite speed of the light coming from an observed star or planet, to affect the apparent direction of the body observed. Tycho Brahe also worked in medicine and alchemy. He was strongly influenced by Paracelsus, who considered the human body to be directly influenced by celestial bodies. The paracelsian view of man as a microcosm, and astrology as the science tying together the celestial and bodily universes was also shared by Philip Melanchthon, and was precisely one of the points of contention between Melanchthon and Luther, and hence between the philippists and the gnesio-Lutherans. For Tycho Brahe there was a close connection between empiricism and natural science on one hand and religion and astrology on the other. Using his large herbal garden at Uraniborg, Tycho Brahe produced several recipes for herbal medicines, using them to treat illnesses such as fever and plague. In his own time, Tycho was also famous for his contributions to medicine; his herbal medicines were in use as late as the 1900s. The expression Tycho Brahe days, in Scandinavian folklore, refers to a number of "unlucky days" that were featured in many almanacs beginning in the 1700s, but which have no direct connection to Tycho Brahe or his work. Whether because he realized that astrology was not an empirical science or because he feared religious repercussions Brahe seems to have had a somewhat ambiguous relation to his own astrological work. For example, two of his more astrological treatises one on weather predictions and an almanac were published in the names of his assistants, in spite of the fact that he worked on them personally. Some scholars have argued that he lost faith in horoscope astrology over the course of his career, and others that he simply changed his public communication on the topic as he realized that connections with astrology could influence the reception of his empirical astronomical work. The first biography of Tycho Brahe, which was also the first full-length biography of any scientist, was written by Pierre Gassendi in 1654. In 1779, Tycho de Hoffmann wrote of Brahe's life in his history of the Brahe family. In 1913, Dreyer published Tycho Brahe's collected works, facilitating further research. Early modern scholarship on Tycho Brahe tended to see the shortcomings of his astronomical model, painting him as a mysticist recalcitrant in accepting the Copernican revolution, and valuing mostly his observations that allowed Kepler to formulate his laws of planetary movement. Especially in Danish scholarship, Tycho Brahe was depicted as a mediocre scholar and a traitor to the nation — perhaps because of the important role in Danish historiography of Christian IV as a warrior king. In the second half of the 20th century, scholars began reevaluating is significance and studies by Kristian Peder Moesgaard, Owen Gingerich, Robert Westman, Victor E. Thoren, and John R. Christianson focused on his contributions to science, and demonstrated that while he admired Copernicus he was simply unable to reconcile his basic theory of physics with the Copernican view. Christianson's work showed the influence of Tycho's Uraniborg as a training center for scientists who after studying with Brahe went on to make contributions in various scientific fields. Although Tycho's planetary model was soon discredited, his astronomical observations were an essential contribution to the scientific revolution. The traditional view of Tycho is that he was primarily an empiricist who set new standards for precise and objective measurements. This appraisal originated in Pierre Gassendi's 1654 biography, Tychonis Brahe, equitis Dani, astronomorum coryphaei, vita. It was furthered by Johann Dreyer's biography in 1890, which was long the most influential work on Tycho. According to historian of science Helge Kragh, this assessment grew out of Gassendi's opposition to Aristotelianism and Cartesianism, and fails to account for the diversity of Tycho's activities. Tycho's discovery of the new star was the inspiration for Edgar Allan Poe's poem "Al Aaraaf". In 1998, Sky & Telescope magazine published an article by Donald W. Olson, Marilynn S. Olson and Russell L. Doescher arguing, in part, that Tycho's supernova was also the same "star that's westward from the pole" in Shakespeare's Hamlet. The lunar crater Tycho is named in his honour, as is the crater Tycho Brahe on Mars and the minor planet 1677 Tycho Brahe in the asteroid belt. The bright supernova, SN 1572, is also known as Tycho's Nova and the Tycho Brahe Planetarium in Copenhagen is also named after him, as is the palm genus Brahea. listen); sometimes written Tÿcho) at around age fifteen. The name Tycho comes from Tyche (Τύχη, meaning "luck" in Greek, Roman equivalent: Fortuna), a tutelary deity of fortune and prosperity of ancient Greek city cults. He is now generally referred to as "Tycho," as was common in Scandinavia in his time, rather than by his surname "Brahe" (a spurious appellative form of his name, Tycho de Brahe, only appears much later). ^ Ivan the Terrible died a year later than predicted by Tycho Brahe. ^ Victor Thoren says: "[the accuracy of the 777 star catalogue C] falls below the standards Tycho maintained for his other activities ... the catalogue left the best qualified appraiser of it (Tycho's eminent biographer J. L. E. Dreyer) manifestly disappointed. Some 6% of its final 777 positions have errors in one or both co-ordinates that can only have arisen from 'handling' problems of one kind or another. And while the brightest stars were generally placed with the minute-of-arc accuracy Tycho expected to achieve in every aspect of his work, the fainter stars (for which the slits on his sights had to be widened, and the sharpness of their alignment reduced) were considerably less well located." (ii) M. Hoskin concurs with Thoren's finding "Yet although the places of the brightest of the non-reference stars [in the 777 star catalogue] are mostly correct to around the minute of arc that was his standard, the fainter stars are less accurately located, and there are many errors." (iii) The greatest max errors are given by Dennis Rawlins. They are in descending order a 238 degrees scribal error in the right ascension of star D723; a 36 degrees scribal error in the right ascension of D811; a 23 degrees latitude error in all 188 southern stars by virtue of a scribal error; a 20 degrees scribal error in longitude of D429; and a 13.5 degrees error in the latitude of D811. ^ According to Owen Gingerich and Christopher Linton, these tables were some 30 times more accurate than other astronomical tables then available. ^ Håkansson 2006, pp. 39–40. ^ Wittendorff 1994, p. 68. ^ a b Håkansson 2006, p. 40. ^ Bricka 1888, p. 608. ^ Dreyer 2004, p. 16. ^ Håkansson 2006, p. 45. ^ Håkansson 2006, p. 46. ^ Boerst, William J. (2003). Tycho Brahe: Mapping the Heavens. Morgan Reynolds Publishing. pp. 34–35. ISBN 978-1883846978. ^ Gannon, Megan (November 16, 2012). "Tycho Brahe Died from Pee, Not Poison". LiveScience. Retrieved November 17, 2012. ^ Christianson 2000, pp. 8–14. ^ Thoren & Christianson 1990, p. 45. ^ Christianson 2000, pp. 12–14. ^ a b c d Björklund 1992. ^ Christianson 2000, pp. 60. ^ Christianson 2000, pp. 207. ^ De nova et nullius ævi memoria prius visa stella Archived 2009-02-24 at the Wayback Machine – Photocopy of the Latin print with a partial translation into Danish: "Om den nye og aldrig siden Verdens begyndelse i nogen tidsalders erindring før observerede stjerne ..."
^ Christianson 2000, pp. 17–8. ^ Thoren & Christianson 1990, pp. 55–60. ^ Christianson 2000, p. 8. ^ Christianson 2000, pp. 7–8, 25–27. ^ Christianson 2000, pp. 28–39. ^ Christianson 2000, pp. 40–43. ^ Christianson 2000, p. 247. ^ West, Mary Lou. "Physics Today August 2001". Archived from the original on 2005-02-15. ^ Christianson 2000, p. 142. ^ a b c Christianson 1979. ^ Thoren & Christianson 1990, p. 188. ^ a b c Christianson 2000, p. 141. ^ Håkansson 2006, p. 62. ^ Mosley 2007, p. 36. ^ Håkansson 2006, pp. 179–89. ^ Christianson 2000, p. 216. ^ Brashear, Ronald (May 1999). "Astronomiæ instauratæ mechanica by Tycho Brahe: Introduction". Special Collections Department. Smithsonian Institution Libraries. Retrieved July 19, 2016. ^ Björklund 1992, p. 33. ^ a b Håkansson 2006, p. 68. ^ Jardine 2006, p. 258. ^ Mosley 2007, p. 28. ^ Christianson 2000, p. 304. ^ Tierney, John (November 29, 2010). "Murder! Intrigue! Astronomers?". New York Times. Retrieved 2010-11-30. At the time of Tycho's death, in 1601, the blame fell on his failure to relieve himself while drinking profusely at the banquet, supposedly injuring his bladder and making him unable to urinate. ^ Thoren & Christianson 1990, pp. 468–69. ^ Dreyer (2004), p. 309: "Ne frustra vixisse videar!". ^ "Brahe, Tycho (1546–1601) – from Eric Weisstein's World of Scientific Biography". Scienceworld.wolfram.com. Retrieved 2012-08-13. ^ Thoren & Christianson 1990, pp. 469–70. ^ Gilder & Gilder 2005. ^ Mallia, Daniel (January 16, 2012). "Did Johannes Kepler murder Tycho Brahe?". History News Network. Retrieved January 19, 2012. ^ Millis, John. "The Death of Tycho Brahe". About.com. Archived from the original on October 15, 2011. Retrieved January 19, 2012. ^ "Tycho Brahe to be exhumed". The Copenhagen Post. February 4, 2010. Retrieved May 27, 2010. ^ "Digging up Brahe". The Prague Post. May 12, 2010. Retrieved May 27, 2010. 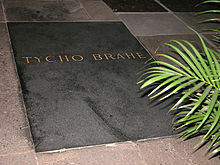 ^ "The opening of Tycho Brahe's tomb". Aarhus University (Faculty of Humanities). October 21, 2010. Archived from the original on October 23, 2010. Retrieved October 27, 2010. ^ "Astronomer Tycho Brahe 'not poisoned', says expert". BBC News. news.bbc.co.uk. 2012-11-15. Retrieved 2012-11-15. ^ "Was Tycho Brahe Poisoned? According to New Evidence, Probably Not". Time. 2012-11-17. Retrieved 2012-11-17. ^ Jonas, Ludwig; Jaksch, Heiner; Zellmann, Erhard; Klemm, Kerstin I.; Andersen, Peter Hvilshøj (2012). "Detection of mercury in the 411-year-old beard hairs of the astronomer Tycho Brahe by elemental analysis in electron microscopy". Ultrastructural Pathology. 36 (5): 312–319. doi:10.3109/01913123.2012.685686. PMID 23025649. ^ "Renaissance astronomer Tycho Brahe was full of gold". EurekAlert!. 1 December 2016. Retrieved 3 December 2016. ^ "Danish astronomer Tycho Brahe exhumed". archaeologycurrentevents.com. Archived from the original on 2012-12-02. Retrieved 2012-08-13. ^ Christianson 2000, pp. 83. ^ Swerdlow 1996, pp. 207–210. ^ Rawlins 1993, p. 12. ^ Wesley 1978, pp. 42–53, table 4..
^ Rawlins 1993, p. 20, n. 70. ^ Thoren 1989, pp. 14–15. ^ Hetherington & Hetherington 2009, p. 134. ^ Repcheck 2008, p. 187. ^ Blair 1990, pp. 361–362. ^ Moesgaard 1972, p. 40. ^ Gingerich 1973, p. 87. ^ Blair (1990), page 361. ^ Blair 1990, p. 364. ^ Moesgaard 1972, p. 51. ^ Blair (1990), page 364. ^ Moesgaard 1972, p. 52. ^ Vermij 2007, pp. 124–125. ^ Graney 2012, p. 217. ^ Blair 1990, pp. 362–364. ^ Stephenson 1987, pp. 22, 39, 51, 204. ^ Swerdlow 2004, p. 96. ^ Stephenson 1987, pp. 67–68. ^ Taton & Wilson 1989. ^ Taton & Wilson 1989, pp. 42, 50, 166. ^ Schofield 1989, p. 41. ^ Schofield 1989, p. 43. ^ Wilson 1989, p. 205. ^ a b Almási 2013. ^ Kragh 2007, p. 122. ^ a b Kragh 2005, pp. 220–22. ^ Hallqvist, Christoffer (7 February 2006). "Al Aaraaf and West Point". Qrisse's Edgar Allan Poe Pages. ^ Olson, Olson & Doescher 1998. ^ Krause et al. 2008. ^ Henderson, Andrew; Gloria Galeano; Rodrigo Bernal (1997). Field Guide to the Palms of the Americas. Princeton, New Jersey: Princeton University Press. p. 54. ISBN 978-0-691-01600-9. Almási, Gábor (2013). "Tycho Brahe and the separation of astronomy from astrology: the making of a new scientific discourse". Science in Context. 26 (1): 3–30. doi:10.1017/s0269889712000270. Björklund, Per-Åke (1992). Tycho Brahe og kamarillaen (Tycho Brahe and the camarilla). Copenhagen: Rhodos. Blair, Ann (1990). "Tycho Brahe's critique of Copernicus and the Copernican system". Journal of the History of Ideas (Submitted manuscript). 51 (3): 355–377. doi:10.2307/2709620. JSTOR 2709620. Brahe, Tycho (1913–1929). J. L. E. Dreyer, ed. Tychonis Brahe Dani Opera Omnia [Collected Works of Tycho Brahe the Dane]. 15 vols. Hauniae In Libraria Gyldendaliana. Bricka, Carl Frederik (1888). "Tycho Brahe". Dansk Biografisk Lexikon. II. Beccau – Brandis. Christianson, J. R. (2002). "The Legacy of Tycho Brahe". Centaurus. 44 (3‐4): 228–247. Christianson, J. R. (2000). On Tycho's Island: Tycho Brahe and His Assistants, 1570–1601. Cambridge: Cambridge University Press. Christianson, J. R. (1967). "Tycho Brahe at the University of Copenhagen, 1559–1562". Isis. 58 (2): 198–203. doi:10.1086/350219. Christianson, John R. (1998). "Tycho Brahe in scandinavian scholarship". History of Science. 36 (4): 467–484. doi:10.1177/007327539803600403. Christianson, John R. (1979). "Tycho Brahe's German treatise on the comet of 1577: A study in science and politics". Isis. 70: 110–140. doi:10.1086/352158. Cowen, R. (18 December 1999). "Danish astronomer argues for a changing cosmos". Science News. 156 (25 & 26). Archived from the original on 2005-08-28. Retrieved 2008-07-28. Dreyer, John Louis Emil (2004) . Tycho Brahe: A Picture of Scientific Life and Work in the Sixteenth Century. Kessinger Publishing. ISBN 978-0-7661-8529-6. OCLC 70058046. Dreyer, John Louis Emil (2014) . Tycho Brahe: A Picture of Scientific Life and Work in the Sixteenth Century. Cambridge University Press. ISBN 978-1-108-06871-0. Ferguson, Kitty (2002). The nobleman and his housedog: Tycho Brahe and Johannes Kepler: the strange partnership that revolutionised science. London: Review. Gilder, J.; Gilder, A. L. (2005). Heavenly intrigue: Johannes Kepler, Tycho Brahe, and the murder behind one of history's greatest scientific discoveries. Anchor. Figala, Karin (1972). "Tycho brahes elixier". Annals of Science. 28 (2): 139–176. doi:10.1080/00033797200200111. PMID 11619597. Gingerich, Owen (1973). "Copernicus and Tycho". Scientific American. 173: 86–101. Gingerich, Owen (1989). "Johannes Kepler". In Taton, René; Wilson, Curtis. Planetary Astronomy from the Renaissance to the Rise of Astrophysics Part A: Tycho Brahe to Newton. Cambridge: Cambridge University Press. pp. 54–78. ISBN 978-0-521-24254-7. Retrieved 2009-11-06. Graney, C. M. (2012). "Science rather than God: Riccioli's review of the case for and against the Copernican hypothesis". Journal for the History of Astronomy. 43 (2): 215–225. arXiv:1103.2057. Bibcode:2012JHA....43..215G. doi:10.1177/002182861204300206. Hashimoto, Keizo (1987). "Longomontanus's" Astronomia Danica" in China". Journal for the History of Astronomy. 18 (2): 95–110. Bibcode:1987JHA....18...95H. doi:10.1177/002182868701800202. Hetherington, Edith W.; Hetherington, Norriss S. (2009). Astronomy and Culture. ABC-CLIO. Håkansson, Håkan (2006). Att låta själen flyga mellan himlens tinnar [Letting the soul fly among the turrets of the sky]. Stockholm, Sweden: Atlantis. ISBN 978-91-7353-104-7. Håkansson, Håkan (2004). "Tycho the Apocalyptic: History, Prophecy, and the Meaning of Natural Phenomena". Acta Historicae Rerum Naturalium Necnon Technicarum. 8: 211–236. Høg, Erik (2009). "400 years of astrometry: from Tycho Brahe to Hipparcos". Experimental Astronomy. 25 (1–3): 225–240. Bibcode:2009ExA....25..225H. doi:10.1007/s10686-009-9156-7. Jackson, E. Atlee (2001). Exploring Nature's Dynamics. Wiley-IEEE. p. 12. ISBN 978-0-471-19146-9. Retrieved 2009-12-20. Jardine, Nicholas (2006). "Kepler as castigator and historian: His preparatory notes for Contra Ursum". Journal for the History of Astronomy. 37 (3): 257–297. Bibcode:2006JHA....37..257J. doi:10.1177/002182860603700302. Kragh, Helge (2005). Fra Middelalderlærdom til Den Nye Videnskab. Dansk Naturvidenskabs Historie (in Danish). 1. Aarhus: Aarhus Universitetsforlag. ISBN 978-87-7934-168-5. Kragh, Helge (2007). "Received wisdom in biography: Tycho biographies from Gassendi to Christianson". The History and Poetics of Scientific Biography. pp. 121–134. Krause, Oliver; Tanaka, Masaomi; Usuda, Tomonori; Hattori, Takashi; Goto, Miwa; Birkmann, Stephan; Nomoto, Ken'ichi (2008). "Tycho Brahe's 1572 supernova as a standard type Ia as revealed by its light-echo spectrum". Nature. 456 (7222): 617–619. arXiv:0810.5106. Bibcode:2008Natur.456..617K. doi:10.1038/nature07608. PMID 19052622. Moesgaard, Kristian Peder (1972). "Copernican influence on Tycho Brahe"". In Dobrzycki, Jerzy. The Reception of Copernicus' Heliocentric Theory. Dordrecht & Boston: D. Reidel Publishing. ISBN 978-90-277-0311-8. Mosley, Adam (2007). Bearing the heavens: Tycho Brahe and the astronomical community of the late sixteenth century. Cambridge University Press. Olson, Donald W.; Olson, Marilynn S.; Doescher, Russell L. (1998). "The stars of Hamlet". Sky & Telescope (November). Rawlins, Dennis (1993). "Tycho's 1004-Star Catalog / The First Critical Edition" (PDF) (PDF). 3. The International Journal of Scientific History. ISSN 1041-5440. Retrieved 2009-09-24. Repcheck, Jack (2008). Copernicus's Secret: How the Scientific Revolution Began. Simon & Schuster. ISBN 978-0-7432-8952-8. Russell, J. L. (1989). "Catholic astronomers and the Copernican system after the condemnation of Galileo". Annals of Science. 46 (4): 365–386. doi:10.1080/00033798900200291. Shackelford, J. (1993). "Tycho Brahe, laboratory design, and the aim of science: reading plans in context". Isis. 84 (2): 211–230. doi:10.1086/356460. Stephenson, Bruce (1987). Kepler's Physical Astronomy. Princeton University Press. ISBN 978-0-691-03652-6. Retrieved 2009-10-10. Schofield, Christine (1989). "The Tychonic and Semi-Tychonic World Systems". In Taton, René; Wilson, Curtis. The general history of astronomy. Volume 2: Planetary astronomy from the renaissance to the rise of astrophysics. Cambridge: Cambridge University Press. pp. 33–44. ISBN 978-0-521-24254-7. Retrieved 2009-11-06. Šolcová, Alena (2005). "From Tycho Brahe to incorrect Tycho de Brahe: A searching for the first occurrence, when the mistaken name of famous astronomer appeared". Acta Universitatis Carolinae, Mathematica et Physica. 46, Supplementum: 29–36. Swerdlow, Noel M. (2004). "An essay on Thomas Kuhn's first scientific revolution, The Copernican Revolution" (PDF). Proceedings of the American Philosophical Society. 48 (1): 64–120. Archived from the original (PDF) on 2011-06-12. Retrieved 2009-10-10. Swerdlow, N.M. (1996). "Astronomy in the Renaissance". In Walker, C. Astronomy before the Telescope. London: British Museum Press. Taton, René; Wilson, Curtis, eds. (1989). Planetary Astronomy from the Renaissance to the Rise of Astrophysics Part A: Tycho Brahe to Newton. Cambridge: Cambridge University Press. ISBN 978-0-521-24254-7. Retrieved 2009-11-06. Thoren, Victor E.; Christianson, John Robert (1990). The Lord of Uraniborg: A Biography of Tycho Brahe. Cambridge University Press. ISBN 978-0-521-35158-4. Thoren, Victor E. (1988). "Prosthaphaeresis revisited". Historia Mathematica. 15 (1): 32–39. doi:10.1016/0315-0860(88)90047-x. Thoren, Victor E. (1967). "Tycho and Kepler on the Lunar theory". Publications of the Astronomical Society of the Pacific. 79 (470): 482–489. Bibcode:1967PASP...79..482T. doi:10.1086/128534. Thoren, Victor E. (1989). "Tycho Brahe". In Taton, René; Wilson, Curtis. Planetary Astronomy from the Renaissance to the Rise of Astrophysics Part A: Tycho Brahe to Newton. Cambridge: Cambridge University Press. ISBN 978-0-521-24254-7. Retrieved 2009-11-06. Vermij, R. (2007). "Putting the Earth in heaven: Philips Lansbergen, the early Dutch Copernicans and the mechanization of the world picture". In Bucciantini, M.; Camerota, M.; Roux, S. Mechanics and Cosmology in the Medieval and Early Modern Period. Firenze: Olski. pp. 121–141. Wesley, W. G. (1978). "The accuracy of Tycho Brahe's instruments". Journal for the History of Astronomy. 9. Wilson, Curtis (1989). "predictive Astronomy". In Taton, René; Wilson, Curtis. Planetary Astronomy from the Renaissance to the Rise of Astrophysics Part A: Tycho Brahe to Newton. Cambridge: Cambridge University Press. ISBN 978-0-521-24254-7. Retrieved 2009-11-06. Wittendorff, Alex (1994). Tyge Brahe. Copenhagen: G. E. C. Gad. Wikimedia Commons has media related to Tycho Brahe. The opening of Tycho Brahe's tomb, Aarhus University. 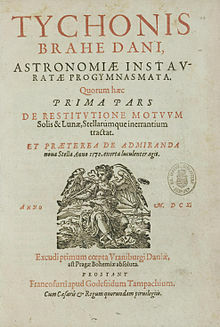 Astronomiae instauratae mechanica, 1602 edition – Full digital facsimile, Smithsonian Institution. Astronomiae instauratae mechanica at the Wayback Machine (archived December 5, 2006) – Full digital facsimile, the Danish Royal Library. Includes Danish and English translations. Learned Tico Brahae, His Astronomicall Coniectur, 1632 – Full digital facsimile, Linda Hall Library.